Start a Business with a Lang BBQ Smoker!! Lang has added a new section to our website. It’s all about how to start a business with your Lang BBQ Smoker. We are telling stories of people who have purchased a Lang and have begun either a restaurant, food truck, catering business or whatever mix and match you want to try. We be posting the stories of people who have already realized their dream of owning their own business and they started by buying a Lang BBQ Smoker!! Whether it’s a large business or a small side business, there is always room for great BBQ and that is what you get when you are #cookingonaLang!!! Tax returns are coming in and maybe you have some money to purchase a Lang BBQ Smoker. Check and see what size is good for your business idea. People come into this business in many different ways, whether it’s helping out with fundraisers in your community, like the Wright Brothers or if you were hosting backyard parties with your Lang like Tony Roy. But the one thing they all have in common is the need for the best equipment in the business, and that is a Lang. You can customize it to exactly your specifications, such as having it placed in a tandem for easy travel. It may be that you want your monogram or logo on your Lang. Perhaps you want something that really sticks in your customer’s minds when they see you. Ben Lang can customize your unit to make it whatever you need it to be. There are so many options available that you really need to think about what you want and then call Ben Lang and go over how and when he can get it built for you. 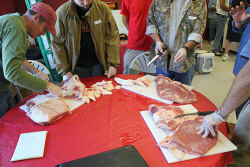 If you want to make certain you are cooking correctly, remember the Lang Q-School has classes 2-3 times per year. You can learn from the best, Chef Paul Kirk. He will walk you through choosing the correct cut of meat, how to process it to get the most money from it. Last but certainly not least, he will make certain you know which is the right size Lang for your needs. Ben is also there, ready to answer any questions you may have. It’s an incredible opportunity to learn and speak to others who are learning or there for refresher courses!!! Lang has come out with some amazing rubs and sauces!! A spicy red sauce and rub and a wonderful peach and mustard sauce that is so good, you could eat it off a quarter and love it!! They bring a unique and wonderful flavor profile to whatever you are #cookingonaLang!! !